Conky is a really cool application able to display whatever info you throw at it, being that your CPU usage stats, free/used storage space, how many emails are in your inbox, if there are any updates available for you package manager, etc. Previously, I have shown you how to configure openbox to get a real minimal desktop that its fast, lightweight and functional. One thing missing on that page was some stats of the running system as well as a pretty clock, in this post I am going to show you how to put a conky-powered big and pretty desktop clock along with some info about your system and email/updates. This is assuming you are using ArchLinux, if you are on other distro, just use your distro package manager to install the package. Important note, conky configuration file is ~/.conky/.conkyrc, BUT WE ARE NOT GOING TO USE OR EDIT THAT file, we are going to use the ones provided in the above file for the stats and email/package updates, and another one for the clock. Later on this post I will show you how to make conky use another file different from the default one. In order to check gmail, you need to edit the python script (gmail.py, provided in compressed file above), note that you have to input your username and password there. Next open the file called conkyrc_archlinux and on the line just after “TEXT” replace the path there with your own home folder. on a terminal and your brand new widget will display some useful info in a very stylish format. Next will be the clock, open the file called conkyrcclock, then replace all instances of /home/myuser with your own home path. This will bring up the clock. The -c switch tells conky to use the specified configuration file (conkyrcclock) and not the default one (.conkyrc). 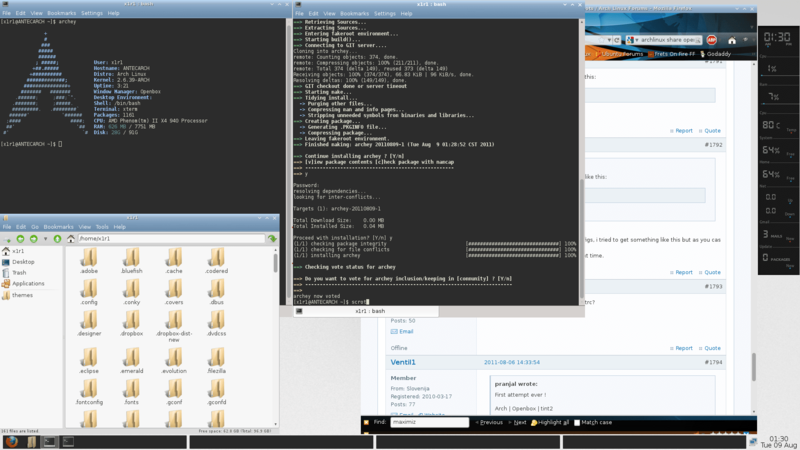 So you should now have 2 conky instances running on your system (don’t worry, memory footprint is VERY small). Now last step would be to add this 2 conky instances to your autostart so they open up as soon as you login. Pacman 4 arrives with package signing! Damn Small Linux is back! conkyconfigs.bz2.zip, and cannot find conkyconfigs.bz2.ZIP, period. Fixed, the file got corrupt while uploading, please try again.